Darth Vader is a very popular movie character, the central character in the Star Wars saga, appearing as one of the main antagonists in the original trilogy and as the main protagonist in the prequel trilogy. This online tutorial will guide you on how to change your voice like Darth Vader while chatting in Skype, using the great help the best voice changer software. - On Voice Changer Software Diamond 8.0 main panel, click Preferences to open the Preferences window. In the Preferences window, we will change Hook mode to Virtual Audio Driver mode. 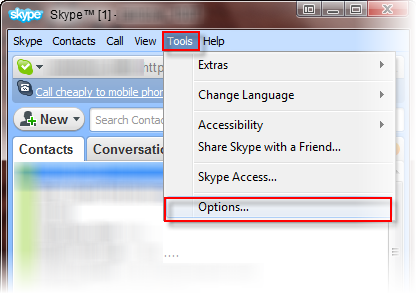 - Run Skype, log into your account. - Choose menu Tools >> Options. - Select Audio settings (1). 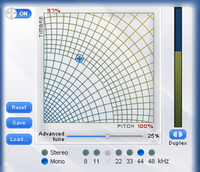 - In Microphone section, select: Microphone(Avnex Virtual Audio Device) (2). 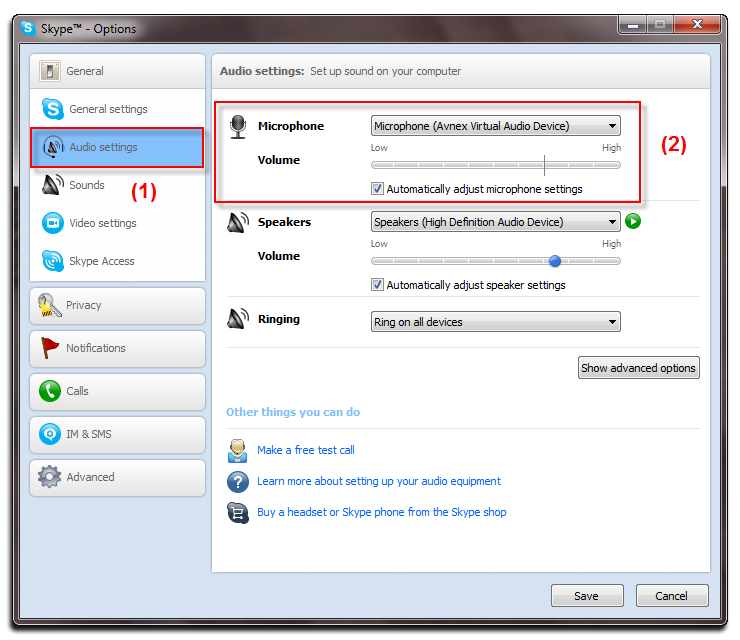 From now on, AV Virtual Audio Driver will be the main audio driver used by Skype. - For instant use, you can download the Darth Vader voice preset from here. - To learn how to work with Voice Changer Diamond’s settings to archive the Darth Vader's voice, click here. Get back to Skype and start the voice VoIP call or voice chat session. The morphing effects is now applied, and your voice is changed. Interested? Grab this advanced voice changer now to enjoy exclusive discount of 30% OFF, only for Voice Changer Review Coupon readers! 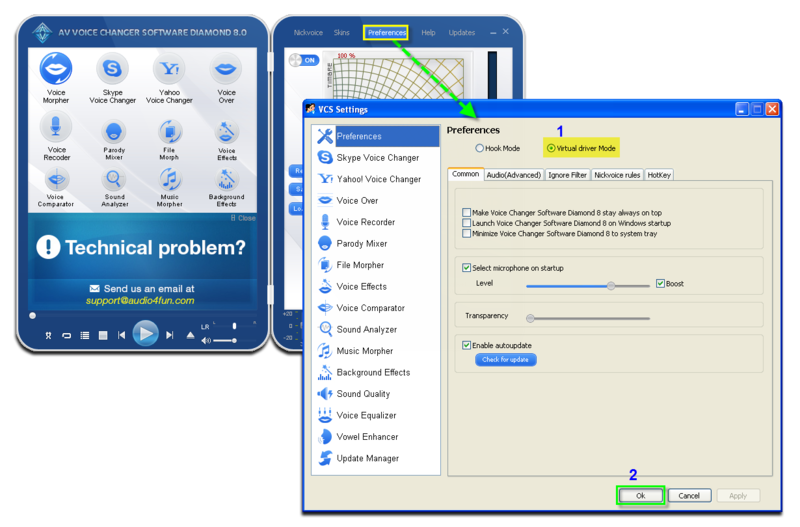 Voice changer software has been reviewed and certified as a professional voice changing tool and it's definitely worth your try. With this tool, you can make your voice sound masculine, feminine, childish, robotic, scary and more. Let's check out the main features which makes AV Voice Changer stand out from other relevant voice changer software. - Blue skin inspires you with professional, cool feeling. - Pink one shows a softer and more playful aspect. Additionally, two main panels including "Remote" module on the left, "Main Function" module on the right are also new additions in order to help you easily control and monitor every single activity. 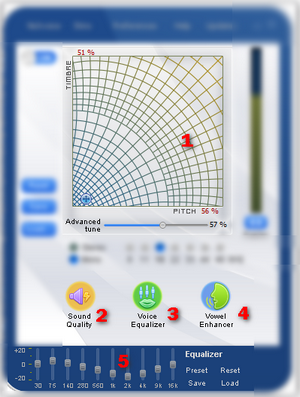 The latest Voice Changer Software Diamond introduces to user a superb voice changing algorithm with curved line graph bringing a completely refreshing feeling. With hundreds of propeller shapes having various areas, every arching set point offers the ability to change your voice tone more smoothly and flexibly in real time. For creative users, this voice changer definitely is the tool-of-smart-choice. 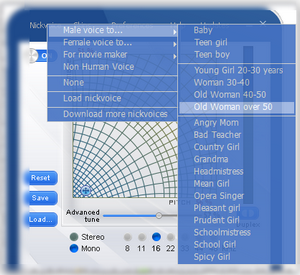 With up to 50 different vivid "nickvoices", Voice Changer Software Diamond offers you a wide ranges of options for changing voice, including "nickvoices" for movie making purposes. Audio masterpieces are only one click away with these ready-to-use built-in "nickvoices"
The best thing is that you don't have to go through many steps to complete this editing process because these advanced voice settings are now available in one panel only. Morphing is far easier now, right?! 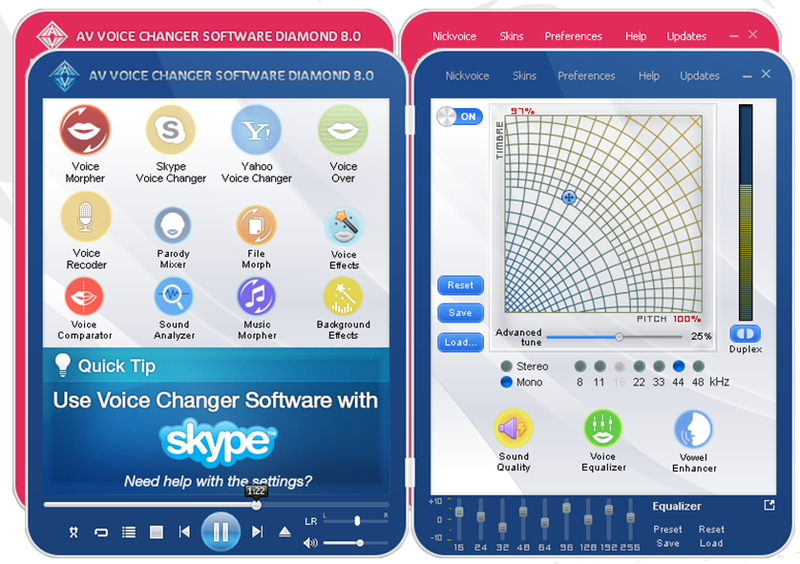 Voice Changer Software Diamond is compatible with many popular Instant Messengers, VoIP applications and most in-game voice chat systems, therefore this tool is the best choice for every online and offline voice changing activities on your PC.